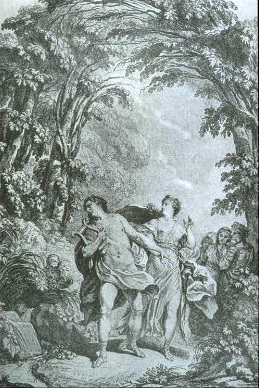 This year’s London Festival of Baroque Music has as its theme ‘Treasures of the Grand Siècle’ and the festival brochure is very French: gold Sun King and etching of Versailles, so I had to double-check when I realised this concert was the 1762, Vienna version (in Italian) of Orfeo ed Euridice, Gluck’s take on the Orpheus myth. David Bates conducted La Nuova Musica with Iestyn Davies as Orfeo, Sophie Bevan as Euridice and Rebecca Bottone as Amore at St John's Smith Square on 13 May 2018. What we heard tonight was, more or less, the original version of the opera, but with the addition of the Elysian Fields music, scored for solo flute and strings, that was one of the additions for the Paris version of 1774. In our version, though the language is Italian, there was a definite French feel: lack of flashy virtuosity; accompagnato recitatives; extended dances and wonderful choruses where the voices move in blocks so we can hear the text very clearly. Tonight’s performance was one of the major attractions of the Festival and it was being recorded. The auditorium was full, as was the stage, with 34 in the band, four per part in the chorus and the three soloists positioned downstage left and separated slightly for the benefit of the recording mics. There was nothing semi-staged about this event; the singers stood stock-still (so as not to compromise the sound quality – though it also meant there were slightly scary moments for the ensemble as the conductor was a long was away and just outside their peripheral vision). The three principal roles were household names (certainly for this audience) and Iestyn Davies was clearly the star attraction. His voice is even-toned and consistently beautiful, and we were in no doubt of his ability to charm all things animate and inanimate. From his opening cry of ‘Euridice!’ to interrupt the chorus, to his pleading with the Furies, the sweetness worked. Nevertheless I was probably in a minority in the audience wanting a bit more of an edge in the dramatic scene with Euridice in Act 3. Sophie Bevan’s feistiness and desperation was clear, and the two voices blended beautifully, but the charm clearly wasn’t working with his dead beloved. Rebecca Bottone resisted the temptation to do the soubrette thing for Amore, and her matter-of-factness contrasted with Orfeo’s wilfulness. The 16-strong chorus provided much variety as mourners, Furies and narrator. As Furies they punched through with their ‘No!’ – showing the limits to Orfeo’s powers. And the rollicking final chorus ‘Trionfi Amore’ had, to my ears, a revolutionary feel. Orfeo is a story about the power of music, and David Bates brought some wonderful things from the band. There was huge variety in the ‘echoes’, the spectacular storm (with thunder and wind coming from the SJSS gallery) at the beginning of Act 2, terrific brass playing throughout, the glorious ‘Elysian Fields’ music with Georgia Browne on solo flute, the arresting harp music from Karen Vaughan, and all the rest. It felt that they took the risks that the singers daren’t take.